What better way to celebrate spring and Easter time than to surround yourself with English nature and wildlife at its best! And there’s no better place to enjoy this than the lovely Kielder Water and Forest Park in Northumberland. 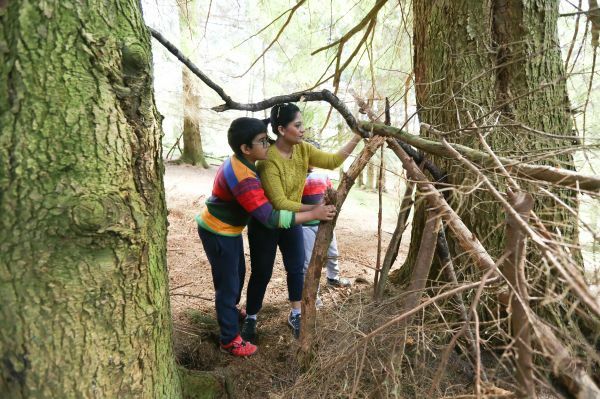 Supported through the National Heritage Lottery funded “Living Wild at Kielder” project, there are some wonderful, fun wildlife activities and events here for all the family to enjoy over Easter and beyond. We’ve put together ten ideas for all ages to enjoy this year in the beautiful surroundings of Kielder. 3. For a totally unique experience for the whole family, why not enrol on a Family Bushcrafts activity? On 11th and 18th April, you can learn a range of bushcraft and wilderness survival skills with a qualified trainer who’s been doing this for over 30 years. Deep in the woods, you all learn how to build a shelter, light a fire, cook an outdoor meal and make something to take away – maybe an elder-wood pea-shooter or a string bracelet from nettles! Children must be five years and over and there is a maximum of two children per adult. The cost is £40 for a family of 4, and £10 for additional person. Booking is essential via www.natureholiday.co.uk or 01434 529154. 6. How about a gentle forest stroll? There are a series of beautiful, new “Wild Walks” at Kielder including one at Bakethin Nature Reserve. This walk is around 2.2km and is accessible to wheelchair users and buggies. On the way, visitors can enjoy exciting new forest features. The “Wild it Up Clearing” is a unique, very special woodland space for all ages to explore wildlife. It is clearly signposted and highly engaging for little people. Another notable feature is a beautiful Wildlife Bench carved especially for the “Living Wild at Kielder” project by award-winning, self-taught Co Durham wood carver Tommy Craggs. Four otters provide arm and shoulder rests, while salmon swim along beneath, and an osprey with outstretched wings, alights from the rear. 10. Enjoy an exciting and informative, hands-on, multi-media journey through Kielder Water & Forest Park’s past and present at Tower Knowe visitor centre. The free exhibition area includes interactive opportunities to learn about Kielder’s wildlife and Art & Architecture Programme, games for young people to learn about forest management and displays on the Northumberland International Dark Sky Park. You will also find a theatre space showing a range of videos- including the creation of Kielder Forest, the dam and history of Kielder Water, wildlife and Dark Skies. Tower Knowe is a great place to visit and as well as the exhibition area, there is a café and well stocked shop.